This book is aims to be a comprehensive source on the physics and engineering of magneto-resistive heads. Most of the material is presented in a nonmathematical manner to make it more digestible for researchers, students, developers, and engineers. 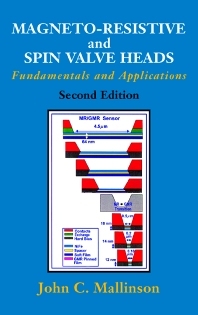 In addition to revising and updating material available in the first edition, Mallinson has added nine new chapters dealing with various aspects concerning spin valves, the electron spin tunneling effect, the electrostatic discharge effects, read amplifiers, and signal-to-noise ratios, making this a completely up-to-date reference. The previous edition of Magneto-Resistive Heads was the first volume in the new Academic Press series in Electromagnetism edited by Professor Isaak Mayergoyz, who is a well-recognized expert in the field. Mallinson Magnetics, Inc., California, U.S.A.